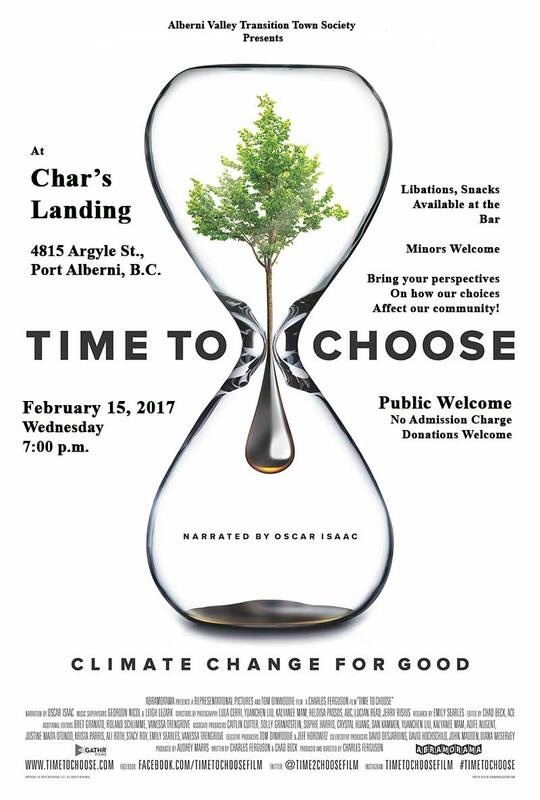 Join us for a meeting starting at 6:00 p.m. on February 15, 2017 to share ideas on making Port Alberni a more resilient and self-supporting community. New input always welcome, and we hope to broaden our membership to support community participation in initiatives in energy, housing, education, food, health, commerce, or whatever might be your area of interest and prior learning. Our film this month deals with some of the challenges and choices that confront us in dealing with economic hurdles and environmental degradation as we move deeper into the 21st Century. There is, perhaps, added urgency to our choices with the rise of resistance to science and the accelerating pace of changes going on around us. This is a good chance to bring your sense of this to the fore.